Discussion in 'Apex Legends' started by 3xTiNcT, Feb 14, 2019 with 38 replies and 2,209 views. How many wins do you have or how many times have you been the champion? I'm sitting at around 30 something right now. I don't know exactly since there's not really a good way to check yet. Feel free to share what your best or highest kill game was as well. Update: Currently sitting somewhere around 100. I lost track but it's either just below or above. All How Many Wins Do You Have in Blackout? How many coins do you have? 5 wins and not much of high kill game and believe highest ever got in a game is 5 kills lol. i have saved all mine just recorded it on the xbox one it's 11 wins with like 400 kills across the 6 legends. I have 2 wins. I just had a 3 kills in each one. First win just hid out till the end and cleaned up the last squad, after they killed squad 3. My other win had a guy with 11 kills on my team. I'm still getting used to playing a fps, been a couple years. 1 win currently... i've never played a br game, so i'm new on the strategies people use. I have only 2 wins. And they were back to back wins. I could've gotten my 3rd win today but my team wasn't so good. 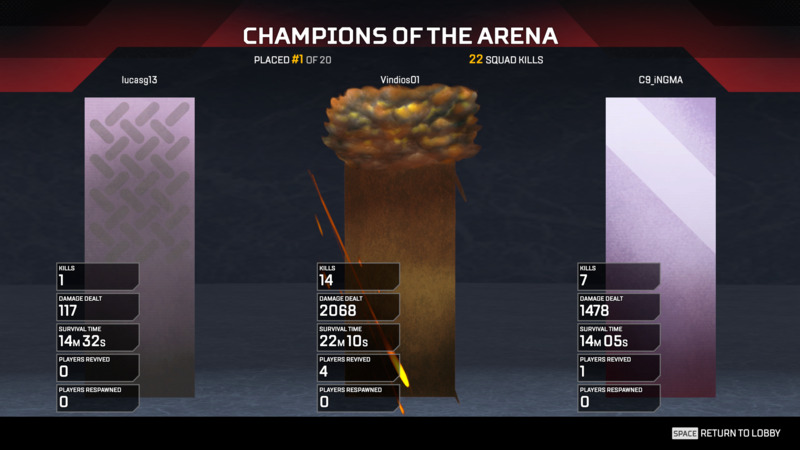 100+ wins and highest kill game is 20. Think I’ve got 30 wins! Over 500 kills with wraith, and highest kill game is 12 on Xbox this is! I have around 10 wins with an average of 7 kills. My best win so far had me at 14 kills. I'd say about 14 or 15 now after just getting another 2 win streak a couple minutes ago. I would probably have many more by now but it took a solid couple of hours for me to get used to the mechanics and whatnot that this game offers up - taking into consideration that I don't play Fortnite and I don't play Black Ops so this whole, twitch-paced Battle Royale type of game is somewhat new to me. Dang I can't even average 5 Kills a game. I have around 55 wins with my highest kill game being 18. Got my first win last night. Gardzz carried me to my first win last night, now sat on 2 wins.